Product prices and availability are accurate as of 2019-04-12 06:05:49 EDT and are subject to change. Any price and availability information displayed on http://www.amazon.com/ at the time of purchase will apply to the purchase of this product. 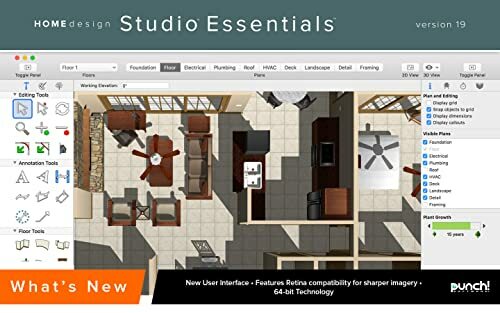 Design or renovate the home of your dreams with our simple to use interface, drag and drop features and one click design capabilities! No design experience required! It's easy to get started! Create your own home plans, use our editable floor plans and layouts or take pictures of an existing room and add design features. Save time and money by visualizing your 2D and 3D designs and estimating costs before you begin. Want more curb appeal, a dream kitchen or ideal outdoor living space? You can make your home look its best from every angle using Home Design Studio Essentials. The all-new version 19 has many new and improved features – all designed with the serious do-it-yourselfer in mind. Creating the home and landscape of your dreams is more straightforward than ever with simple timesaving tools! New! Faster, more powerful home and landscape design features. New! 64-bit technology as well as retina compatibility for the sharpest imagery in a Mac-friendly user interface. Redesigned roofing system plus 2D drawing engine. New! 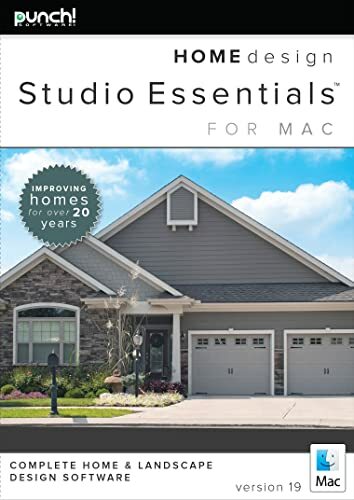 30+ home plans plus new kitchen, bath and outdoor templates. New! Thousands of 3D objects, materials and paint colors in a redesigned Content Library Management System with improved search, navigation and display. New! Customizable 2D plant symbols with thousands of trees, flowers and shrubs in the plant library. Plus plant inventory tool bar to organize and adjust your selections. New! SketchUpTM Import! 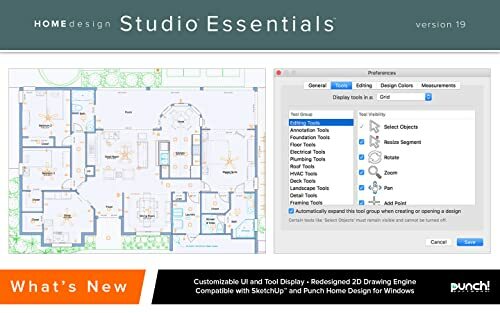 Compatible with new SketchUp versions, easily edit size and materials within the program. New! Online video tutorials, updated user guide and user forum. 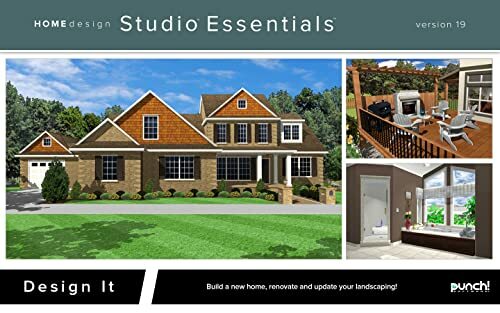 With this new home design software, you can create your own home and landscape design with professional results! Renovate or redecorate your home, both inside and outside. Create outdoor living areas and so much more. There’s no limit to what you can do using your creative inspiration and Punch! So why put off that kitchen or bathroom remodel? Or maybe you’ve always wanted a new deck for backyard entertaining? With the capability to build up to 6 floors, you have the power to build almost anything. 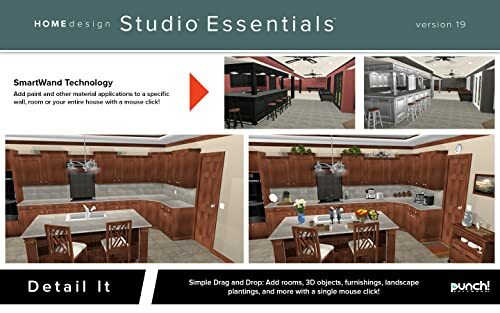 Start quickly with editable floor plans and layouts, or use pictures of an existing house then drop in design features and details. New and more robust features let you build complete new kitchens, baths and landscapes in just a few clicks. Add rooms and decorate for a personalized look. Elements bridge together seamlessly with automatic snapping and alignment for drag and drop – all with sharper dimensioning. SmartWand™ technology quickly adds paint and other materials to walls, rooms or your entire house. Fine tune the home plan’s outside appearance with shutters, gable walls, roof panels and dormers. The new shutter selection lets you add perfectly aligned shutters in a snap. Build your own decorator windows to block winds and control light or add some charming detail. Breath-taking yet practical landscaping can flourish in your planting zone. Design a work-ready plan that accounts for your climate, seasonal changes and topography conditions. The Automatic Growth Tool shows how your landscape will look now and in the future as plants grow and mature. Proper planning will ensure you buy only the plants you really need to complete your design. Maximize the appearance of outdoor spaces with drag-and-drop options and realistic lighting design tools to make planning your dream yard and outdoor rooms a breeze. The new interface, assistant features and one mouse click design capabilities are better than ever! Budget is a big concern for just about every homeowner. 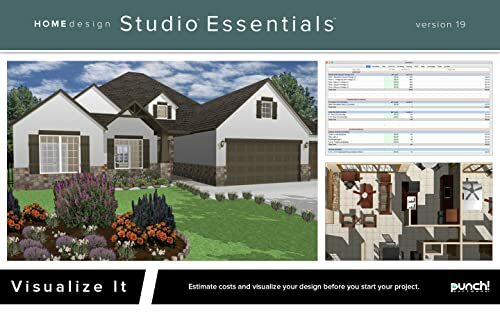 With Home Design Studio Essentials, you can forecast material costs and avoid surprises. The cost estimation tool breaks down building and renovation costs room-by-room. A comprehensive budget will help put your plans into action. Visualize your designs before you begin your DIY home project, renovation and updates. The process will go smoother when you know what to expect. An expanded selection of resources ensures that your process will be as enjoyable as it is efficient. Find exactly the kind of help you need, when you need it. Handy video tutorials show how to use tools to their full potential and complete project tasks. Tap into even more information through the Punch User Forum or contact Free Tech Support. Punch! Software launched with the premise that 3D design software should be just as fun as it is productive to use. With more than 3 million units of its Mac and Windows products sold via retail stores across the world and online, Punch! Software ranks as a best-selling home and landscape design software brand in the world. Design or renovate the home of your dreams with our simple to use interface, drag and drop features and one click design capabilities! No design experience required! Contains a wealth of tools and top features for designing new home plans, kitchen renovations, bathroom renovations, basement remodel and more. It's easy to get started! Create your own home plans, use our editable floor plans and layouts or take pictures of an existing room and add design features. Save time and money by visualizing your 2D and 3D designs and estimating costs before you begin. Includes how-to video tutorials, user forum and free technical support to provide help when needed.